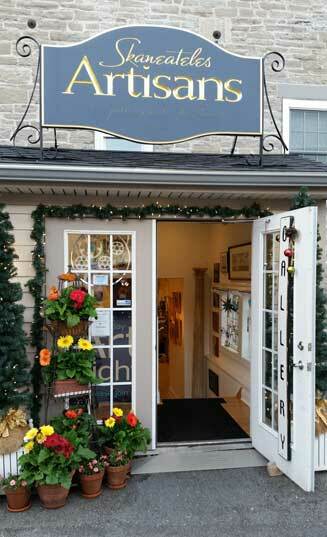 Skaneateles Artisans Gallery Under the Old Stone Mill is owned and operated by artist entrepreneur Teresa Vitale, a painter of fine finishes & more. Teresa is a self taught artist in business for over 35 years creating timeless art on a wide variety of surfaces using her faux and decorative painting techniques. I strive to provide a venue to sell my own art as well as art crafted by many gifted local artists. It is my mission to bring quality unique art to the community and to help support the arts. I invite you to come and enjoy, stroll leisurely throughout the gallery, and take it all in. You will be amazed at the art that fills our space, and tremendous talent and gifts the artists posses. We hope you will visit. Click here for directions to our gallery. 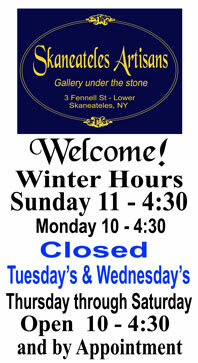 .Contact us by sending email to skaneatelesartisans@gmail.com.